Blog Breathing new life into the website! 2018 has been incredibly busy. And we’re finally able to share some news about recent projects. In the near future you’ll be seeing a lot more from this website now that the big projects are finished off. For quite some time Bret has been working with Skybound to get a new series out to the public. That series is titled “Stellar,” and you’ll be seeing it very soon. Reviews are already out, interviews have taken place, and Bret can finally talk about this project without any spoilers. There’s a lot of excitement going along with the launch of “Stellar.” And the press has been very good so far. Recently Bret was interviewed about the work by Newsarama. We have to say, the headline and content were very positive! 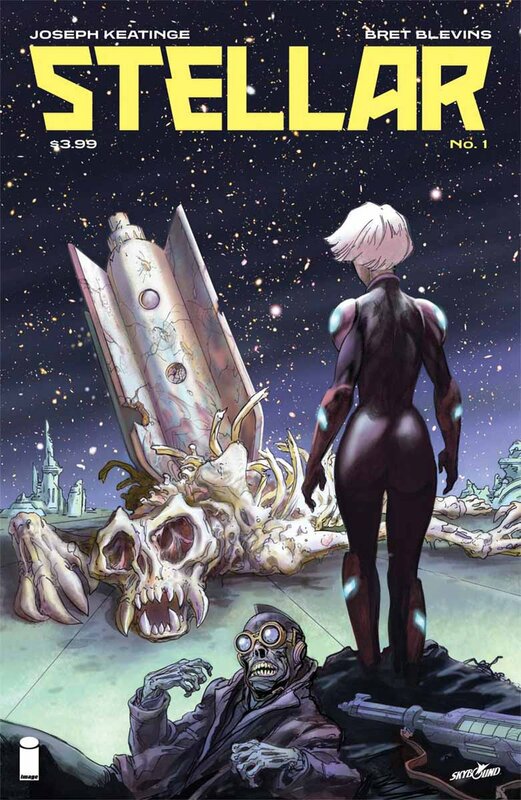 Memorable Big Two artist Bret Blevins returns to mainstream comic books this June in a sci-fi story about a bounty hunt gone wrong – based on an original idea by Robert Kirkman and Marc Silvestri. Nice to be part of the headline! Be sure to read the full article by clicking here to learn more about the work and an excellent collaboration! In addition to working with Skybound, Bret has also been busy producing more amazing content for Harley Quinn. Newsarama also has a good post regarding this project, so be sure to stop by and give it a read. Paul Dini is reuniting with the character he co-created in a serialized story beginning in the back of April’s Harley Quinn #17, according to ComicsAlliance. Dini, who co-created Harley Quinn with Bruce Timm for Batman: The Animated Series, will co-write the serial with Jimmy Palmiotti, who co-writes the main series; Brett Blevins will illustrate the story. With the heavy lifting done on Stellar, and with the latest Harley issue completed, Bret is now focusing on a new project he’s been wanting to do for a while. This project has been a long time coming, and we’re excited to share it here with you before we announce the project anywhere else. Bret Blevins Art of Visual Storytelling – Online Classes from Bret! For several years now Bret has been kicking around the idea of offering a series of online classes for people interested in the type of work he does. From basic illustration all the way through professional works, Bret is looking to share what he knows with you. And finally, with some major projects squared away he’s got the time to bring his classes to life. Bret has taught countless courses over the years to students. His “in person” courses covered drawing and illustration basics, bringing images to life, life drawing, painting, and more. So he’s incredibly familiar with teaching students how to improve their work. But now the goal is to share his skill set and story telling techniques to a much larger audience! The outline for his first course is already set. Filming for the tutorial series has already started. And we’re announcing the classes here first before you see it anywhere else. Stay tuned here and you won’t be disappointed. A Kickstarter will be launched soon to offer fans a way to be part of this new class series from Bret. And when it’s released we’ll let you know! **This article was written and posted by RLC Design on behalf of Bret. We promise to get Bret on here soon to start posting new articles. We’ll be working with him over the next few months on this site, and on the new classes he’s building. It’s very exciting to see this project come together! Please move forward with the Visual Storytelling Project after the disappointing Kickstarter response. I just can’t get college art instruction that covers what you are proposing to teach based on your amazing and diverse career.